Paper Hang Tag is smudge-proof with a slight gloss finish on the front. Plant tag is made of colorful paper card sheet, oval shape with thread. It is also known as Tag Lable or Price Lable. 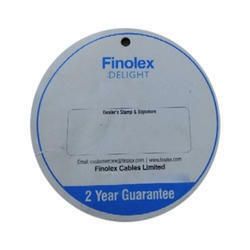 In order to suit the various and precise requirements of our esteemed clients, our enterprise is dedicatedly engaged in providing Paper Hang Tag in the market.